Most email services limit the size of attachments you can send by email. For instance, you can only send attachments up to 25 MB using Gmail and 20 MB with Outlook. And with most email services the file types you are allowed to send as attachments are restricted. For instance, using Gmail, you can’t send .exe (executable) files or even zipped files with an .exe file inside. But no problem! 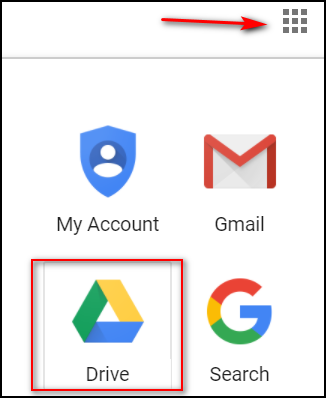 If you use Gmail, you already have a Google account – and if you have Google account you have Google Drive. And you can share very large files (up to 10 GB) using Google Drive? 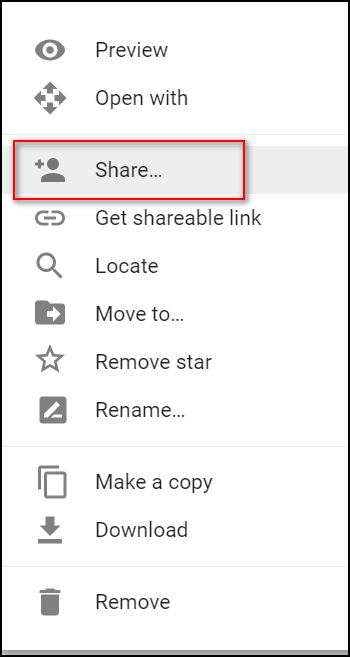 First, if the file you want to share are not already on Google drive, you’ll need to upload it. 2. Click on Drive (see above). 3. 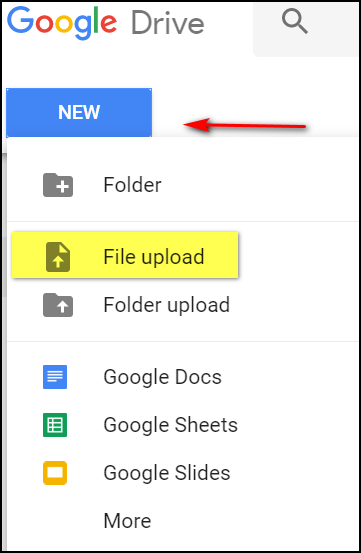 When Google Drive opens, click on the blue button labeled “NEW” on the left side, Then click “File upload” and a window will open. From there you can navigate to the file on your hard drive that you want to upload go Google Drive. 4. 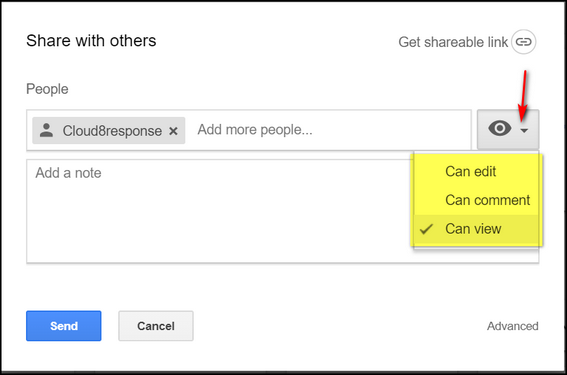 Once your file is uploaded, right-click on it and choose “Share” from the menu. 5. 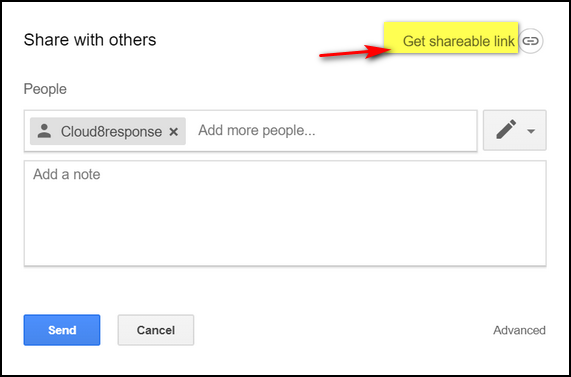 Once you click “Share” you’ll see the following dialog (see screenshot below). Type in the email address of the person you want to send the file to. You can add as many email addresses (one at a time) by clicking “Add more people”. 6. Before you send your file, you can change the option below to your preference. If you want recipients only to view the file you can set permissions. You choices are “Can edit”. “Can comment”. and “Can View”. 7. When you’re all done, just click the blue “Send” button (above) and a link to your file will be sent to everyone whose email address you’ve included. Every Google account has 15 GB of space, minus what you’ve used. Of course, if you’ve been around the block a few times, you know that there are many sites, some free, that will let you share large files. But if you already use Gmail, you already have Google Drive – and you already have access to a great way to share large files up to 10 gigabytes. So why not use it?